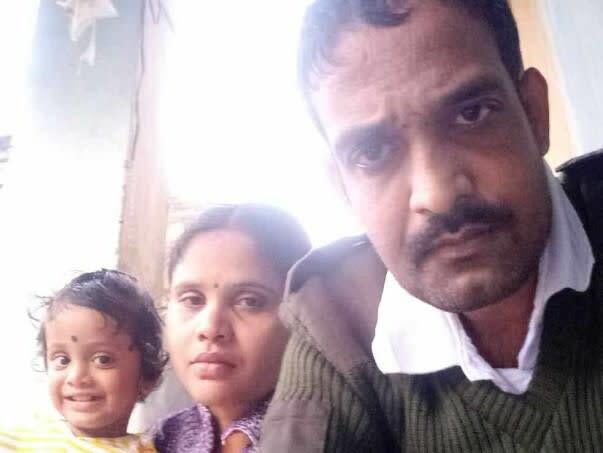 3-year-old Jayanth’s childhood has come to a tragic standstill. Once a playful and talkative child, there’s only a deafening silence when he’s around now. Only his painful screams are heard in the hospital. The tumour in Jayanth’s brain is aggressive. No matter how much Chaitra comforts her son, the reality is that without treatment, Jayanth’s cancer will quickly spread to other parts of his brain. 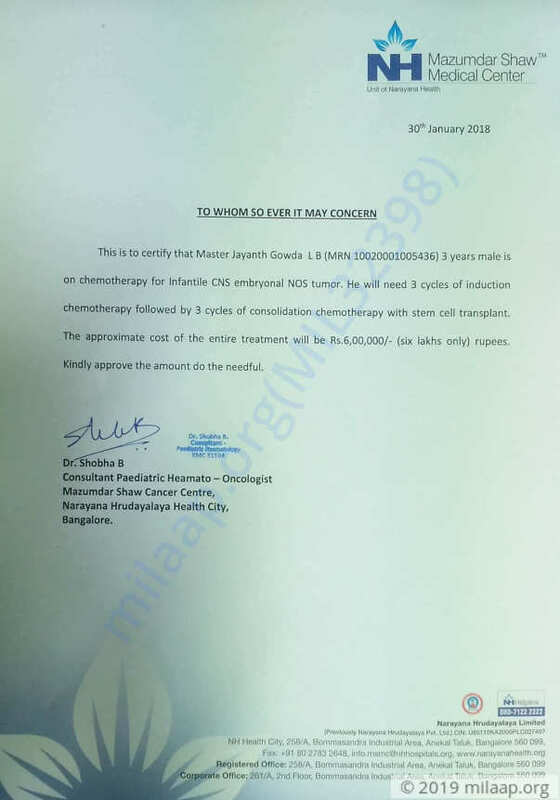 Jayanth needs chemotherapy to beat cancer. Otherwise, his condition will deteriorate beyond repair. It’s his only chance to survive. In December, Jayanth was taken to the hospital after he had a high fever. Even after medications, his fever did not subside. Chaitra and Boodesh didn’t understand what was happening to their son. For 15 days, Jayanth was in pain and discomfort from the fever. Nothing made him feel better. The doctors finally asked him to get an MRI scan, and nothing has been the same for him since. Jayanth doesn’t have any energy left anymore. He doesn’t talk much and can barely sit up on his own. He has completed 3 cycles of chemotherapy so far, but he still has a long way ahead of him. He needs 5 more cycles, followed by possible radiation and a stem cell transplant to survive. If cancer spreads further, even chemotherapy might not save the little one. Last year was filled with trials and tribulations for Boodesh and Chaitra. In August, Boodesh was admitted to the hospital owing to a liver problem. They spent nearly 6 lakhs on his treatment. They were just about recovering financially and emotionally when they found out about Jayanth’s cancer. His diagnosis has not only made them extremely stressed but has also set them back financially. Now, they have nothing left. 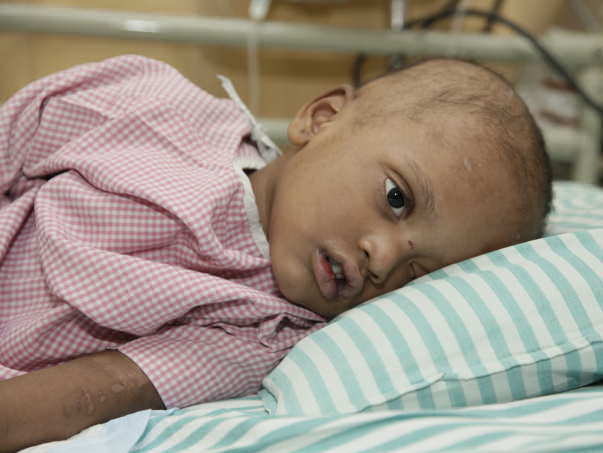 Jayanth has a deadly tumour in his brain and needs to continue treatment to get better. 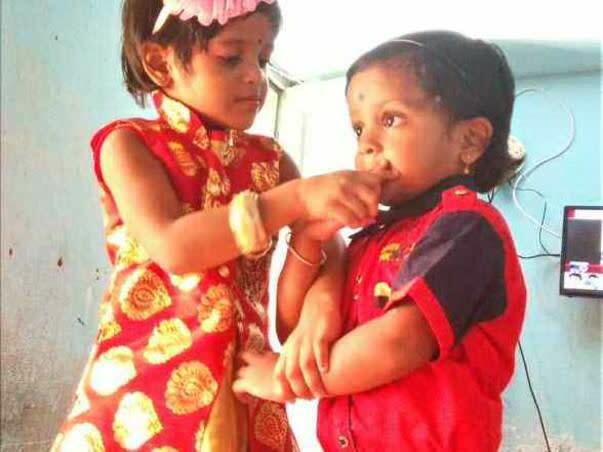 The family needs Rs 6 lakhs to get 5 more cycles of chemotherapy, but Chaitra and Boodesh can’t afford treatment any longer. This is Jayanth’s only chance to beat cancer. He needs your help to get treatment that can save his life. Your support can save Jayanth’s life. Currently he is doing well. He has completed RT will now undergo MRI brain to see how he is responding to the treatment. Thank you once again. We shall keep you posted. Here's a quick update on Jayanth. He is doing ok and is planned to undergo MRI in order to see how he is responding to the treatment. We shall keep you posted. Thank you once again. Please keep praying.